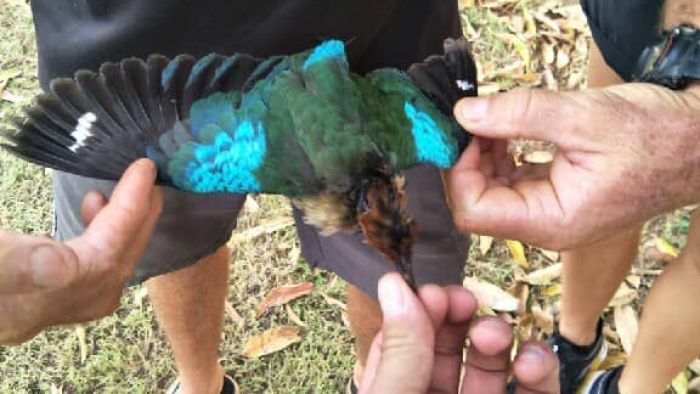 The second-known sighting of an Asian fairy pitta in Australia has ended “tragically” with the endangered bird overshooting its migration route and hitting a bar window in Broome before being killed by predator, with bird-lovers saying a cat is the likely culprit. “It’s really symbolic of the threats all of our native species face every day in Australia,” Mr Greatwich said. It was thought to have crashed into one of the bar’s windows, temporarily stunning itself. “The staff there at Matsos, where it had shown up, had just done the right thing and they’d taken it into care and put it in a box,” Mr Greatwich said. The bird was later released by the bar manager and seen feeding in the bar’s garden over the next two days. “It’s very rare, probably only a handful of people in Australia have ever seen one,” Mr Greatwich said. “And even in its natural range where it occurs it’s still difficult to see as well. He said that occasionally fairy pittas and their close relative, blue-winged pittas, “overshoot” their migration, finding themselves looking for shelter along the Kimberley coast. “It’s terribly exciting,” Mr Swann said. “Finding it dead was very unfortunate,” Mr Baxter said. “This is just rather tragic because it’s an extremely rare bird,” he said. “It appears to have been taken by something, quite possibly a cat, but we’ve really no proof of that,” Mr Swann said. Mr Greatwich also said the cat was the most likely cause of the fairy pitta’s demise. “There are definitely other predators out there that could have done it, so for example, goannas or snakes, or birds of prey like goshawks,” Mr Greatwich said. Mr Baxter said the nature of the fairy pitta’s injuries, with a daytime attack leaving bite marks around the head, and the way the bird was left uneaten, make cat predation the only reasonable explanation. “Cats tend to kill their prey with a bite to the throat, and more often than not, they’ll kill and drop — more so for practice than actual need for food,” he said. “Recent research shows that up to 377 million birds every year get predated by feral cats across Australia,” Mr Greatwich said. The fairy pitta’s corpse was recovered and will be preserved in a museum collection for future research.